Beautifully radiant with a rich crimson hue, the garnet is said to inspires one's passion, devotion, and fidelity. 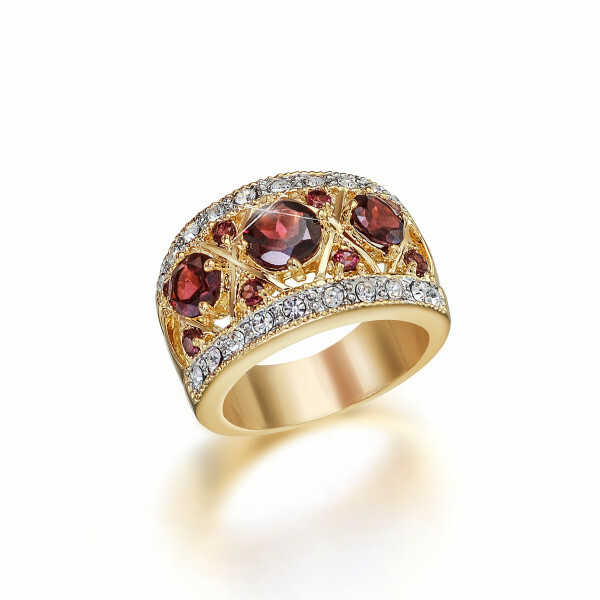 For centuries the garnet has been the stone of royalty, appearing in the crown jewels of nearly every royal family. Exquisitely designed to resemble a royal crown, this gorgeous ring is a fiery fusion of vintage style and sparkling modern accents. Crowning our regal ringare 3 large round garnets - with a total weight of over 2.00 carats - hand-cut to maximize the stones' natural red color. Eight smaller garnets add sparkle and color between the main stones. The golden setting is banded by 20 brilliant, clear Swarovski crystals that are hand-set into silvertone channels on each side of the garnets. Available in whole sizes only from 5 to 10, the ring comes in a velvet pouch and makes a perfect gift.